Milwaukee’s Serb population dates to the late nineteenth century, when Serbs seeking industrial employment immigrated to Milwaukee and other cities along Lake Michigan’s waterfront, including Racine, Kenosha, and Chicago. This early Serb population arrived in Milwaukee as part of a larger movement of peoples from the Austro-Hungarian controlled areas of the Balkans, such as Slavonia, Lika, Vojvodina, Bosnia, and Herzegovina. They tended to seek work in the meat packing plants and tanneries along the city’s south side lakefront, where they found work at the bottom rungs of arduous industrial work. Their population numbers in West Allis were large enough for them to form a short-lived fraternal organization in 1906. 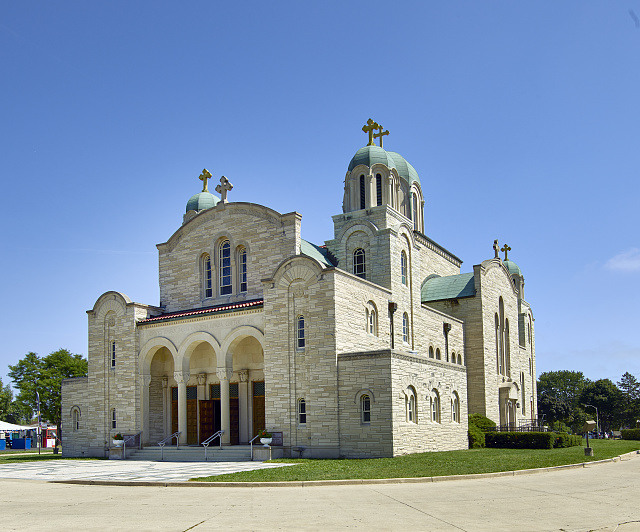 Serbian ethnicity in Milwaukee has developed around Serbian Orthodox churches. Serbian Orthodoxy is a sect of Eastern Orthodoxy. The traditional Serbian Orthodox Church in America is tied to church leadership in Belgrade, Serbia, receiving directives on dogma and doctrine. The importance of Orthodoxy to many Serbian ethnics in America has derived historically from the location of Serbia within the Balkans: caught between the Roman Catholic Church in Western Europe, and the Islamic empires and states, most notably the former Ottoman empire. Interethnic strife was tied to religious conflict, and many Serbs in the Balkans experienced religion not just as spiritual belief, but as a community which fostered friendship and togetherness. Many Serbs in America, and certainly in Milwaukee, built Serbian Orthodox institutions as a way to develop community among American Serbs and those who had newly arrived to the city. The first such Orthodox church in Milwaukee was St. Sava, founded in 1912 by the developing Serbian community in the Walker’s Point neighborhood. Services at St. Sava were initially conducted in a member’s home, but shortly thereafter it was moved to a more permanent location at Third Street and National Avenue, where it stayed for more than four decades. Through St. Sava Serbs developed athletic clubs and other social organizations, such as choirs and political discussion groups, that were tied to the church but not entirely religious in nature. Serbian immigration was cut off by the restrictive federal immigration policies during the 1920s. It resumed in the post-World War II years as religious and political refugees from Communist Yugoslavia gained admittance to the U.S. under the Displaced Persons Act of 1948. The community grew, and by the early 1990s, some informal estimates of the Serbian-American population in the Milwaukee area placed the population at 15,000. But the census estimates are lower, estimating around 5,500 Milwaukeeans of Serbian ancestry in the early 21st century. The Serbian-American community in Milwaukee grew in visibility in 1950, when Serb Hall opened on Oklahoma Avenue and Fifty-First Street. Serb Hall was intended to be a social place for the community, with weddings, dances, and other banquets forming the bulk of the activities there. By 1958, St. Sava moved onto a parcel of land attached to the southern end of Serb Hall’s property, where it continues to function as a Serbian Orthodox church. In the 1960s, a split in the Serbian Orthodox Church led 300 families of St. Sava to leave the Belgrade-led church, join the Free Serbian Orthodox Church of the United States and Canada, and organize St. Nikola in 1963 in Cudahy. The specifically Serbian ethnic orientation of the churches has provided a context of community in which the Serbian language has remained in use despite some generational decline. The metropolitan area’s Serbs have tended to remain close to the central city as well. Majorities reside within the city’s borders or in Milwaukee County. ^ Charles A. Ward, “The Serbian and Croatian Communities in Milwaukee,” General Linguistics 16 (1976): 151; “Eastern Orthodox in Wisconsin,” Dictionary of Wisconsin History, Wisconsin Historical Society website, http://www.wisconsinhistory.org/dictionary/index.asp?action=view&term_id=11204&search_term=eastern+orthodox, last accessed December 23, 2011. ^ Ward, “The Serbian and Croatian Communities in Milwaukee,” 151. ^ Dan Sokolovic, “It Takes a Village: From Serb Hall to St. Sava,” Express Milwaukee, January 10, 2011, last accessed December 23, 2011; Deborah Padgett, “Settlers and Sojourners: A Study of Serbian Adaption [sic] in Milwaukee, Wisconsin” (PhD diss., University of Wisconsin-Milwaukee, 1979), iii. ^ Sokolovic, “It Takes a Village”; “Church History,” St. Sava Serbian Orthodox Cathedral, Milwaukee, Wisconsin, http://www.stsava-milw.org/history.html, last accessed February 13, 2012, information now available at http://stsava-milw.org/church-history/, last accessed July 31, 2017. ^ Ward, “The Serbian and Croatian Communities in Milwaukee,” 152. ^ Sidney Greenfield, “There Ought to Be Public Discourse about Serbian Nationalism of Past,” The Milwaukee Journal-Sentinel, September 27, 1995; Ward, “The Serbian and Croatian Communities in Milwaukee,” 152. ^ Padgett, “Settlers and Sojourners,” 172-177; “Serbs Split with Synod, Form Own Parish,” The Milwaukee Journal, January 25, 1964; United States Supreme Court Reports, Serbian Eastern Orthodox Diocese for the United States and Canada v. Milivojevich, et al, 426 U.S. 699 (1976). The church name has changed over the years. See The Serbian Orthodox Church in North and South America website, accessed July 27, 2016, and Saint Nikola SOC Cudahy WI Facebook page, last accessed July 31, 2017. Padgett, Deborah. Settlers and Sojourners: A Study of Serbian Adaptation in Milwaukee, Wisconsin. New York, NY: AMS Press, 1989.